This no bake dessert recipe is not only elegant, it’s super easy! The best part is that you can make it ahead of time so it’s perfect if you have guests coming over! Cream together cream cheese and lemon juice until soft. Add whipping cream and beat on medium for 2 minutes. Add in sugar beat until stiff and fluffy. 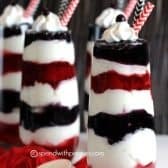 In jars or glasses, layer pie fillings and cheesecake mixture. Top with additional whipped cream or whipped topping if desired.